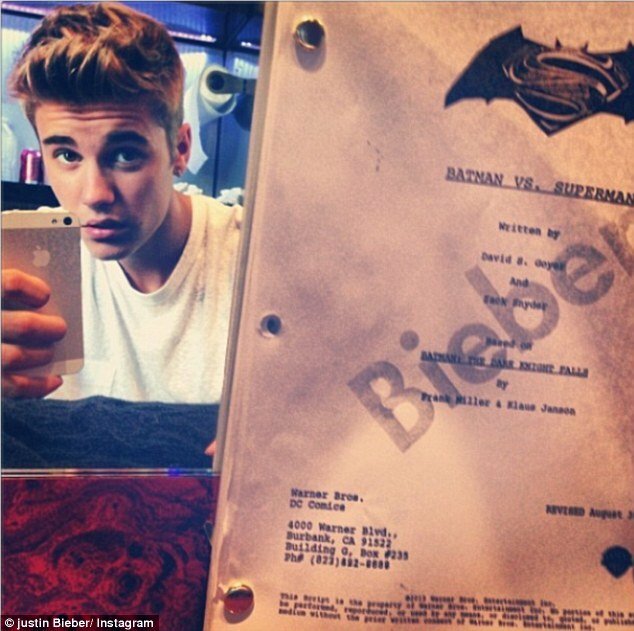 Justin Bieber posted a photo of his very own copy of the Batman Vs. Superman script. Justin Bieber, a huge Batman fan, received a customized Bat bike as his 19th birthday present from his father. In the Instagram snap posted on Friday, Justin Bieber is holding up the personalized script, printed with “Bieber” across the front. A fan of taking photos of himself, Justin Bieber also made sure to capture his reflection in the mirror as he used his smartphone to take the shot. With a caption of “#robin? ?”, Justin Bieber left fans wondering whether he may be auditioning for the upcoming role in Henry Cavill’s sequel to Man Of Steel. Batman Vs. Superman is currently in the works, with Ben Affleck taking on the powerful role of the Dark Knight himself. Yet, Justin Bieber could have just been playing a trick on his social media followers. Because earlier in the day, the pop star was seen arriving at the studio to film Funny Or Die with Lil Za and Lil Twist. “Off to do something funny or…die :),” he tweeted. Fans will just have to wait to find out the truth behind Justin Bieber’s mystery script.